This post feels a little bit like cheating because I have posted this recipe previously. However, the original photo doesn’t do it justice, and the original post is not even about the bread. 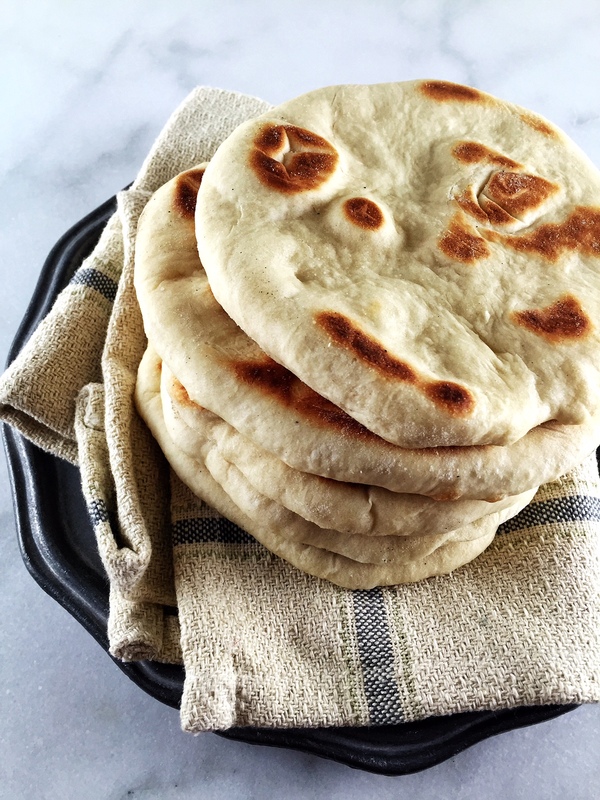 Naan is easy to make, and it keeps well in the refrigerator or freezer. I love to have with with curry because it’s great for soaking up all the delicious liquid. I first learned how to make naan in college. One of my friends would make it in an electric skillet because there were no ovens in the dorms. I recently made cauliflower and butternut squash curry with coconut milk and I’m not quite sure if I decided to make the curry for the naan or the naan for the curry. Now that I own a Baking Steel, I use that to bake the naan. A pizza stone works equally well. You can also just bake it on a cookie sheet under the broiler. 1. Combine all dry ingredients in a bowl and whisk well. 2. Add water, melted butter, and yogurt into the dry ingredients and mix well with a wooden spoon. 3. Turn dough out onto a floured surface and knead for about 5 minutes. You can sprinkle a little bit more flour if the dough is too sticky. 4. Put dough in a greased bowl, cover with plastic wrap and let rest for 90 minutes or until doubled in size. 5. If you have a baking steel or a pizza stone, pre-heat it one hour before you plan on baking the bread. 6. Once the dough has doubled in volume, knead dough for five minutes and divide into 6 pieces, approximately about three ounces each. 7. Roll out each piece into a five inch round. 8. Bake naan for two minutes, then flip, and bake for another two minutes. Make sure to flour your peel so that the naan does not stick to the peel. Alternatively,you can bake the bread on a cookie sheet under the broiler. If not using immediately, let the breads cool, place in a zip top bag, and refrigerate. Hooray for naan! Those look so beautiful and pillowy.I usually cook my naan in a frying pan, but now I want to give baking them a try!